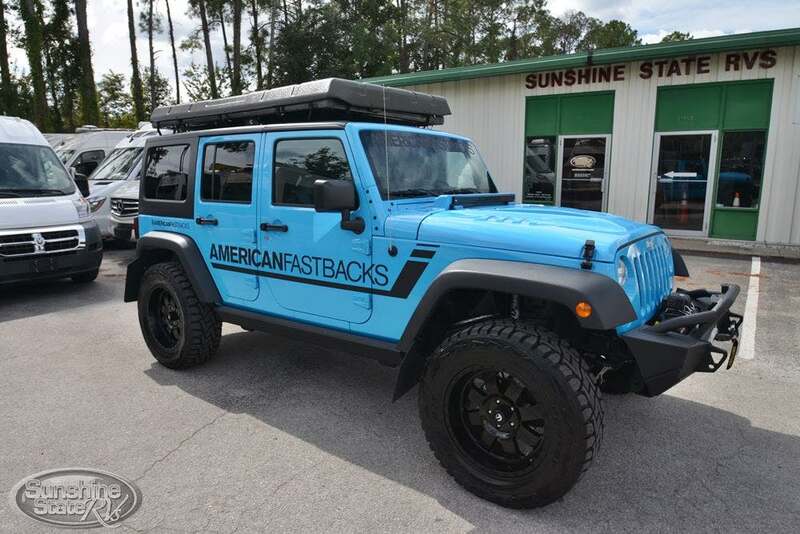 Introducing the all-new?American Fastbacks Badlands! It?s a rugged, one-of-a-kind Jeep, equipped with a stove top, fridge and a roof-mounted electric hardtop camper, allowing you to extend your trip, wherever you may go. This Jeep is a RVIA certified RV and qualifies for RV financing at around $400 a month in payments!? The insurance is also cheaper being that it is a RV. The Badlands offers 2 sleeping areas, giving you the ability to sleep 4 people (2 in the camper above and 2 in the rear section of the Jeep).? Both areas come with comfortable sleeping pads?for when you?re ready to kick back and relax after a day of adventuring. Other custom features include leather seats, MOPAR suspension lift, Fox shocks, 20? wheels, 35? tires, tow package, sleeper kit, fenders, inner fenders, bumpers, running boards, hood, grille, fire extinguisher and mount. This Jeep is a great deal at only $62,950. Trades accepted!